Stranger in a Strange Land is the epic saga of an earthling, Valentine Michael Smith, born and educated on Mars, who arrives on our planet with “psi” powers—telepathy, clairvoyance, precognition, telekinesis, teleportation, pyrolysis, and the ability to take control of the minds of others—and complete innocence regarding the mores of man. After his tutelage under a surrogate father figure, Valentine begins his transformation into a kind of messiah. His exceptional abilities lead him to become many things to many people: freak, scam artist, media commodity, searcher, free love pioneer, neon evangelist, and martyr. 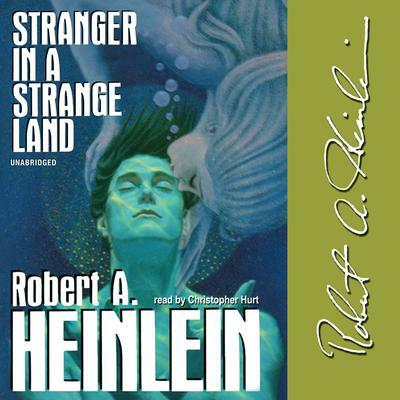 Heinlein won his second Hugo Award for this novel, sometimes called his “divine comedy” and often called his masterpiece. This Blackstone audiobook is the “as published” version, read from an Ace paperback published in 1987. The full, uncut text was not made available until 1991. Stranger in a Strange Land is the epic saga of an earthling, Valentine Michael Smith, born and educated on Mars, who arrives on our planet with “psi” powers—telepathy, clairvoyance, precognition, telekinesis, teleportation, pyrolysis, and the ability to take control of the minds of others—and complete innocence regarding the mores of man. Heinlein won his second Hugo Award for this novel, sometimes called his “divine comedy” and often called his masterpiece. This Blackstone audiobook is the “as published” version, read from an Ace paperback published in 1987. The full, uncut text was not made available until 1991. It was an unending struggle for me to finish this audiobook, though I did finally manage to do so. Instead of being the sci-fi novel I anticipated it to be, it was more of a theoretically futuristic story combining cult religious fundamentalism, enlightened spirituality, "Stepford Wives", socio-political commentary with never-ending sexual encounters in couples and groups. I tried to continuously remind myself of when it was written (1961 I think), however I feel that is still no real excuse for the rampant sexism along with disrespectful and demeaning roles to which women are relegated, especially since it was supposed to occur in a more advanced future - the future portrayed was more technologically advanced, but with very few cultural and societal advances. It is annoying and disappointing that the writer seemed incapable of incorporating or envisioning equality of the sexes. Certainly the future portrayed in the book was not an appealing one and that is integral to the story and its messages. There were also other aspects of the writing itself which were a bit grating for me in addition to an unsatisfactory narration. Unfortunately, this was another male narrator that causes women to sound like spineless airheads (however, to be fair to the narrator, the writing did not help this aspect either). I also found his narration to be overly robotic at times and limited in scope in his portrayal of the different characters (male and female). Some characters were portrayed better than others. The book does contain thoughtful and insightful philosophical and spiritual views, but the presentation of them was not enjoyable for me overall. I believe the book could have presented the same messages and ideas in easily half the length. For me, most of this book felt like wasting my time, but I like to be fair and finish a book and also to feel that I did not waste my money - though I am still disappointed with this purchase. Although there are many fans of this book, I am definitely not one of them. Too dated, too long, overly sexist and, in my view, not truly sci-fi.